Nobis Engineering, Inc. (Nobis) is proud to be at the forefront of the escalating solar industry in the State of New Hampshire. 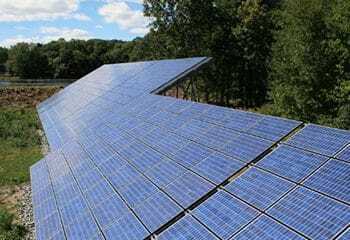 Currently partnering with NH Solar Garden, Nobis has permitted or is currently in the process of permitting 15 solar projects located throughout central and southern New Hampshire. Nobis is providing designs for a variety of small (less than 1 Megawatt) and large scale (greater than 1 Megawatt) projects including ground-based, rooftop, and car-port type systems. Solar arrays such as these are being developed on municipal and privately-owned properties that are currently being transformed from underutilized assets to sustainable, renewable energy resources. With this number and diversity of solar projects, Nobis has been recognized as New Hampshire’s leading consulting firm in the solar renewable energy field providing comprehensive public relations, regulatory negotiations, land planning, engineering design, and permitting services. Nobis Engineering successfully designed and permitted the largest multi-site solar installation in New Hampshire history. Located in the City of Franklin, this nearly 10 Megawatt system is designed to supplement the city’s electricity demand and transfer excess power directly to the energy grid. The project allows the City of Franklin to transform underutilized land into sources of clean energy while reducing their overall electricity costs.